We are authorized dealers, Maple Leaf Diamonds, Mark Schneider, Carlex, Tissot, Movado, Citizen and many more brands. At Boulevard Diamonds we have the ability to offer custom design services, using high quality materials. Our design team is committed to creating exquisitely-crafted jewellery that is one-of-a-kind, unique, and reflective of your personality and lifestyle. Boulevard Diamonds is a full-service jewellery store that offers expert jewellery repairs, restoration and quality watch repair. All repairs are personally handled by our professional goldsmith and watch technician, which greatly reduces the turn around time and cost. 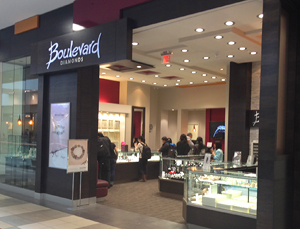 Boulevard Diamonds is an active member of the Canadian Jewellery Association and the Edmonton Chamber of Commerce.